Goodreads says, "When shy Jenny Cooper goes to stay with her cousin Jane Austen, she knows nothing of the world of beautiful dresses, dances, secrets, gossip, and romance that Jane inhabits. At fifteen, Jane is already a sharp observer of the customs of courtship. So when Jenny falls utterly in love with Captain Thomas Williams, who better than Jane to help her win the heart of this dashing man? But is that even possible? After all, Jenny’s been harboring a most desperate secret. Should it become known, it would bring scandal not only to her, but also to the wonderful Austen family. What’s a poor orphan girl to do? Jenny Copper, Jane Austen's best friend and cousin, practically saves Jane's life while they are at a horrid boarding school. Thanks to Jenny, Jane's mom rescues them and takes them back to the Austen's house, which is very much different than the life Jenny has grown accustomed to. Jenny is an orphan and the Austen's take her under their wing as she only has her brother and her insufferable sister-in-law to look after her. While at the Austen's house, Jenny is hiding a secret that could ruin her reputation and one that involves Captain Thomas Williams. She doesn't think too much of it until she sees Captain Thomas Williams again at a local ball and realizes her secret could come back to haunt her. She needs Jane's help with not only this detrimental secret, but also to win the heart of Captain Thomas Williams. Cora Harrison's darling novel, I Was Jane Austen's Best Friend, is a charming tale that will warm your heart long after you read the final page. I am obsessed with all things Austen, so I knew I would really love this book, which is written mostly as a diary from Jenny's point of view. It also includes snippets of Jane's writing and some beautiful illustrations. Harrison's portrayal of Jane Austen as a teenager is exactly how I imagined her to be. Also, Jenny is the heroine that we have all come to love in Austen's novels. She is smart, brave, and sometimes jumps to conclusions, but that's why we love her. At the end of the book, readers will like Harrison's note regarding Jenny's actual existence, which only made me appreciate I Was Jane Austen's Best Friend even more. Many of the other characters were reminiscent of Austen's famous characters, such as Captain Thomas Williams. He is very similar to many of Austen's swoon-worthy love interests. Jane's mom also reminded me a bit of Elizabeth Bennet's mom with all of her drama and her reminders that they must marry rich. I loved being lost in Austen's world and Harrison made it so pleasurable. I Was Jane Austen's Best Friend is such a feel good novel with its perfect combination of romance, historical fiction and a bit of a mystery. It easily became one of my favorite books of the year and I will definitely be recommending it to fans of historical fiction and Jane Austen. I had a happy book hangover for days! Now if only I could get the sequel, Jane Austen Stole My Boyfriend, published in the US! So glad to hear it's good. I feel in love with the cover about a year ago. Ooooo I haven't heard much about this book, but I'm becoming a bigger and bigger fan of historical fiction! Love that she gives us some info on Jenny's actual existence too, I always love when we get little extra tidbits like that:) Fantastic review Christina! I hadn't heard of this one before, but it sounds really good. Thanks for the great review! Also, the cover is gorgeous!! this looks so cute to me! i have seen some iffy reviews so i am so glad to hear you liked it so much! 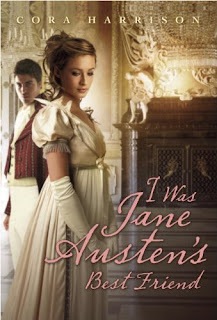 I love Jane Austen, but I was a little wary of this book. The book description didn't seem all to interesting to me, but after reading your review I think it is a must read for any Jane Austen fan. Becky- It did--it's such a feel good read. I need to definitely get the sequel from Book Depo! Juju- The cover is so cute. I agree! Jenny- Thank you! :) I love the fact that Jenny is based off a real person. It made it that much more special. Leanna-Love this cover too! Thanks for stopping by! I can' wait to read this! I am glad to hear that you liked it so much. I wonder if you could get the sequel through Book Depository?